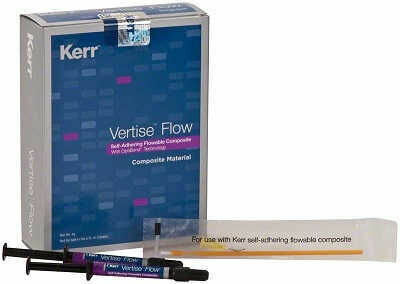 Vertise Flow, the first self-adhering dental composite powered by OptiBond. It greatly simplifies your direct restorative procedures by incorporating a bonding agent into a flowable. With this flowable dental composite, there is no need to bond separately, reducing steps and saving time. Vertise Flow shares the same characteristic inherent in self-etch materials and reduces the chance of post-op sensitivity. leadership in resin restorative dentistry comes after decades of innovation in dental composites and expertise in adhesives - both of which come together in Vertise Flow.